Join the Portland Regional Chamber of Commerce and PROPEL, our young professionals group, at CoworkHERS for an evening of light fare, cocktails, and networking with a twist! Join PROPEL and Sexual Assault Response Services of Southern Maine (SARSSM) on Thursday, February 7th from 5:30 – 8:00pm at Maine Mead Works (51 Washington Avenue, Portland) for PROPEL’s first In Focus Event of 2019. The In Focus Event Series provides a means for young professionals to learn about nonprofits, and to identify opportunities to volunteer, donate their professional services, and serve on the boards of the organizations they learn about. It's a Birds and the Bees pre-Valentine's Day event where you'll have the opportunity to enjoy the best Honey Maker mead that Portland has to offer, and with your ticket you'll get free chocolate treats from some of Maine's most loved confectioners! The chocolate treats will be a taste of what's to come at SARSSM's annual Chocolate Lovers' Fling in April. All event proceeds, including: ticket sales, raffles, and donations will be given in full to SARSSM. Machias Savings Bank, the sponsor for the In Focus series, has generously agreed to match up to $500 of proceeds from the event in support of SARSSM. Join PROPEL for its second Pro.U series event on December 11! The upcoming Pro.U event is hosted in partnership with the University of Maine, PROPELing local university graduates into professional roles and building more connections within the greater Portland business community. The event will take place at Mast Landing Brewing Company, whose founders met the first day of freshman year at the University of Maine. Enjoy delicious craft beer (the first one is on us!) and enter for a chance to win a Mast Landing gift card and tickets to other local events. Mark your calendars for Thursday, November 29th & join us for this year's JAM Fest! An exciting addition to PROPEL’s In-Focus Series, JAM Fest will celebrate the many volunteers of Junior Achievement of Maine (JA) as well as PROPEL’s commitment to help young professionals grow in their careers, create meaningful connections and become more deeply rooted in the community. This year's JAM Fest attendees will enjoy: Delicious catered hors d'oeuvres, entertainment from the Brass section of the Maine Academy of Modern Music, and 2 free beers courtesy of our sponsors from Allagash and Rising Tide. New This Year: The event will feature a panel of Portland's business & community leaders as they get interviewed by kids who've gone through JA's educational programs! Tickets are FREE! But space is limited, so register ASAP to claim your spot! PROPEL believes community engagement is an integral part of professional development and building a well-rounded business profile. JA will also be highlighting one special "Volunteer of the Year". Through volunteer-delivered, hands-on programming for K-12 students statewide, JA programs foster work readiness, entrepreneurship, and financial literacy, helping to prepare today's students for the demands of tomorrow. JA programs bring relevance to academics, deliver authentic learning experiences, and create an immersive learning environment by connecting students to the real world around them. Programs are free to all teachers and bring community volunteers into classrooms to share their own work and life experience with students, opening their minds to career opportunities right in their backyards. During the 2017-2018 school year, 565 volunteers contributed their time teaching nearly 14,000 K-12 students in 797 classrooms statewide. JA of Maine hopes to increase these numbers this upcoming academic year and welcomes new volunteers. JAM Fest kicked off in 2015, presenting retired educator Donna Stephen with JA's first Volunteer of the Year Award. Over 200 members of the business community have attended the volunteer celebration event each year since then to listen to the live music, hear from local students, and learn more about upcoming volunteer opportunities. Join Propel for our second In Focus event of the year on Thursday, November 8th from 5:30 – 8:00pm at Fork Food Lab (72 Parris St, Portland, ME 04101). This is Propel’s second time hosting a Taste the World event, during which attendees have the opportunity to fill their plates with delicious delicacies from across the world, made by New Mainer Culinary Entrepreneurs here in Portland. The success of our first event led to the development of the New Mainer Culinary Entrepreneur Program, which supports immigrant and refugee entrepreneurs in the culinary field in Maine through a multi-pronged approach, including a New Mainer Culinary Entrepreneur Scholarship that covers the cost of a three month membership at Fork Food Lab and other startup costs, along with business support from CEI’s Start Smart program. As a result of the New Mainer Culinary Entrepreneur Scholarship, its first recipient Aklilu Tsaedu, owner of Niyat Catering, was able to launch his Ethiopian catering business at Fork Food Lab. Learn more about the program and Akiliu’s success at: http://www.propelportland.org/culinaryentrepreneur. This year’s event is being hosted in partnership with Fork Food Lab, Coastal Enterprises Inc., Catholic Charities of Maine’s Refugee and Immigration Services, and Maine Access Immigrant Network. All event proceeds will directly support the next recipient of the New Mainer Culinary Entrepreneur Scholarship. Our generous In Focus Event Series sponsors at Machias Savings Bank have offered to match up to $1,125 in event proceeds, so please buy your tickets now and make additional donations if you are able to! Our last Taste the World event was a sold out event, so buy your tickets while they last! Last year, WEX Inc. began Tech Talks: an internal platform for our employees to share how their work interacts with cutting edge technologies like blockchain, artificial intelligence, and user experience design. Now, we're bringing it to the Portland community! We want our first Tech Talk Portland event to be an opportunity for Maine’s lively technology community to learn, connect, and innovate together—and we want you to be a part of it! *Ticket is limited to one per person by system, but feel free to register multiple tickets separately. Price includes 1 drink ticket and complimentary appetizers. Join PROPEL and In Her Presence on Thursday, September 6th from 5:30 – 8:00 pm at Red Thread (1 City Center, Portland) for PROPEL’s first In Focus Event of the year. The In Focus Event Series provides a means for young professionals to learn about nonprofits, and to identify opportunities to volunteer, donate their professional services, and serve on the boards of the organizations they learn about. At the event, enjoy local beers, good eats, and networking, while learning about how you can support and get involved with the organization In Her Presence. All event proceeds including ticket sales, raffles, and donations will be given in full to In Her Presence. Machias Savings Bank, the sponsor for the In Focus series, has generously agreed to match up to $500 of proceeds from the event in support of In Her Presence. In Her Presence is a women’s non-profit organization based in Portland Maine. Toting the slogan Out of the Shadow and Onto the Stage, the group hosts English language classes and a variety of educational workshops to provide a platform for Maine immigrant women to better integrate and succeed here in Maine. Join us as we recognize greater Portland's business community for the amazing work they've done over the past year. 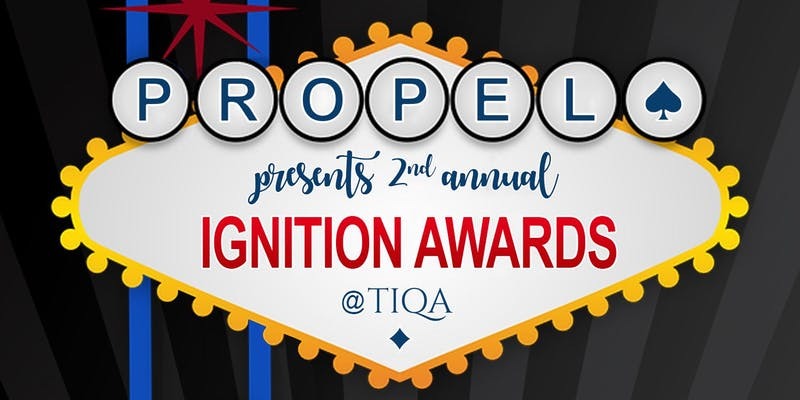 The Ignition Awards take place on 28th 2018 from 5:00 to 8:30 at TIQA. In addition to the awards themselves, this Casino-Themed event will feature delicious Mediterranean food, entertainment from Amazing DJ Music (Sound and Photography), casino games and a signature cocktail for High Rollers. The ticket price includes 1 drink ticket and complimentary appetizers from TIQA!! This year we've also added a new award category which will highlight an individual! Brought to you by Old Port Advisors, the new award will spotlight Portland's first Young Professional of the Year! We are accepting nominations for all award categories now through June 7th! Thank you to our sponsors at Purdue University Global Maine, WEX, Certify, and Old Port Advisors for making this night possible! 1. “Hustler of the Year” - The Entreverge Award. Startups or small businesses that are grinding every day to make their dream or passion a reality. 1. Young Professional of the Year - Young Professionals that go above & beyond with their work in their industry or community organizations. PROPEL and the Portland Regional Chamber of Commerce are very excited to announce the 2nd Annual Ignition Awards, brought to you by Purdue University Global Maine, WEX, Certify & Mainebiz. Join fellow young professionals and emerging leaders from throughout southern Maine for networking and reconnecting! Each attendee will receive a token for their first beer free! in the weeds - Legalized Recreational Marijuana and How It Will Impact Portland. Due to the size of the venue we can only sell 35 tickets - It will likely sell out quickly. Click here to buy your tickets now! Ticket Price: $10 Early Bird Tickets Now Thru 2/5/2018, $15 After. Ticket Price Includes Free Beer. Profits will go to fund the Maine Ambassador Program. 5:30-6:30PM: Open Networking - Meet and get to know some of the other local professionals keeping themselves abreast of this rapidly-evolving business environment! 6:30-6:40PM: Meet the New Business Owner - Hear from Mark Barnett, Owner of Higher Grounds, about why he came home to Maine to open a new business in Portland, and the part he's playing in the redevelopment of Wharf Street. 6:40-7PM: Hear from candidate for Governor and State Senator Mark Dion. 7:00-7:10PM: Hear from local Real Estate Broker Justin Lamontagne. 7:10-7:20PM: Hear from candidate for Governor and former State Representative Diane Russell. 7:20-7:30: Q&A with our guest speakers. Join us December 11 for our second round! For our December Kegs & Issues we will welcome Anne Heros, Executive Director of the Center for Grieving Children, to the stage. Melissa Smith from WEX will serve as our emcee for the night as the Portland Regional Chamber of Commerce and PROPEL co-host this event at Aura. Join PROPEL and Junior Achievement of Maine as we celebrate the 3rd Annual JAM Fest! Enjoy local beers, good eats, and networking, while learning about volunteer opportunities and the answer to the ultimate question: Are You Smarter Than a JA 5th Grader? Best of all - Tickets are FREE! But donations are accepted. All attendees will receive 2 free beer tickets, but you must register to receive your beer tickets! Those who register by October 5th be entered to win an L.L. Bean gift card! Hit the button below to register for yours! Serving as the kick-off to PROPEL’s In-Focus Series, JAM Fest South will celebrate the many volunteers of Junior Achievement as well as PROPEL’s commitment to help young professionals grow in their careers, create meaningful connections and to become more deeply rooted in the community. PROPEL believes community engagement is an integral part of professional development and building a well-rounded business profile. Hello! Somehow you've found the old event page for last year's Ignition Awards. Please CLICK HERE to be taken to the page for this year's (2018) Ignition Awards! PROPEL is teaming up with the Chamber of Commerce & the City of Portland to bring you our next After Hours event on April 26th. We'll be enjoying delicious burgers and drinks from the newly opened BRGR Bar as the City unveils their new Comprehensive Plan for the city of Portland! Registration is free but space is limited, so sign up now to reserve your spot. If you haven't made it out to BRGR BAR yet, take this opportunity to try one of their acclaimed 'Adult Milk Shakes' while you network with young professionals and witness the future of Portland. While some people still think of them as just cookies, campfires, and friendship bracelets, Girl Scouts are so much more. When a girl is a Girl Scout, she's also a G.I.R.L. (Go-getter, Innovator, Risk-taker, Leader)(tm). These traits define girls of courage, confidence, and character, who make the world a better place. This is the Girl Scout DNA, and every day, girls are taking the lead like a Girl Scout! Girl Scouts are big thinkers, groundbreakers, and role models. Girl Scouts design robots, start garage bands, and improve their communities-and yes, they sell the best cookies on the planet. During our event, we'll be having a Girl Scout Cookie takeover at Fork Food Lab. Fork Food Lab member chefs will be preparing delicious and fun Girl Scout Cookie concoctions for everyone to try while they network and learn about how the Girl Scouts smash leadership stereotypes. We'll also be selling cookies at the event and all profits will benefit Girl Scouts of Maine and make future events like this one possible. Buy your tickets today to support female leadership development and empowerment in Maine. Research has shown recently that less than 8 cents of every dollar granted by US foundations goes toward girls and issues relevant to them - so let's make sure to raise some funds for them! Tickets are $20 in advance, or $25 if purchased the day of the event; tickets include all the Girl Scout Cookie treats you can manage! Thank you to the Maine Technology Institute for being the official sponsor for this event. MTI provides funding for Maine’s Innovators to bring their ideas to the market, so it's happy to sponsor this event that supports the Girl Scouts of Maine new focus on innovation that will strengthen Maine’s pipeline of female innovators, scientists and leaders. Learn more about MTI at: www.mainetechnology.org/. This February PROPEL and Spurwink Services invite you to spread the love at our first co-hosted Winter Carnival. As part of PROPEL's In Focus series, we'll be raising awareness and funds for Spurwink. The carnival is a family friendly event, fun for all ages, including ice skating, tubing on The Rink at Thompson's Point's new tubing hill, a winter obstacle course, food trucks such as Maker's Mug, and more. Tickets are $15 for adults, with free admission for kids. Tickets include skate rental, tubing on the hill, and for adults, your first beer, which was donated by the amazing Shipyard Brewing Company. Event proceeds will benefit Spurwink and will make it possible for PROPEL to host similar events in the future. Spurwink helps children, adults and families affected by behavioral health challenges and developmental disabilities live healthy, engaged lives in their communities. Spurwink provides behavioral health and education services for children, adults and families. They operate 20 different community-based programs located in towns and cities throughout southern and central Maine, serving more than 4,500 individuals a year. Kick off 2017 with After Hours networking featuring one of our 2016 entreverge winners, Lone Pine Brewing Company! Learn more about Lone Pine Brewing and their passion for producing quality beer in the East Bayside neighborhood from Co-Founders John and Tom. Enjoy a Portland Pale Ale in the tasting room and tour the brewery floor while networking with other young professionals. Ticket includes printed nametag and 1 drink! Buying your first home can be an overwhelming and confusing process. Gain guidance and info from the team of DOMAINE at this Professional Development Lunch. You'll get an overview of the entire buying process to better prepare you to enter the real estate market. Mortgage rates are low, homes are affordable and the market is full of highly motivated sellers. Why throw away money on rent when you can be your own landlord? Bring your questions and your appetite- lunch will be served! Join us for an After Hours networking event featuring one of our 2016 entreverge winners, American Roots! (Check out this short video about their mission!) Learn more about American Roots and their commitment to our community from co-owners Ben Waxman and Whitney Reynolds. Meet other young professionals, enjoy snacks & beverages provided by PROPEL, and tour the production area and newly opened retail space. In 2013, after spending 12 years in Washington, DC, founder and co-owner, Ben Waxman moved back to his hometown of Portland, Maine with a dream to create jobs in the place that he grew up and loved. It took about a year contemplating how to make this happen and in what form this dream would come to fruition until one day, he realized that what he loved was what he grew up watching his mother create. A family of textiles and a business of manufacturing. In 2014, Ben and his fiance AR co-owner Whitney Reynolds, took a trip to Massachusetts to a woolen mill and it was then that Ben’s dream started to gain momentum. He had watched the highs and lows of manufacturing in America and thought; why not bring this incredible industry that essentially disappeared in the United States back to life? From this vision, American Roots was born. The idea was simple; take Ben and Whitney's rolodexes and make them the foundation of sales. Take from that the ability to reach additional sales models of a growing number of Americans who want and need American made products. Please join PROPEL, The Portland Club, and Black Tie Companyfor an exciting night of music, drinks, magic, and socializing with other Greater Portland young professionals on November 17th at Together We Toast! This public, 21+ event will take place from 6-8:30pm at The Portland Club on State Street in Portland and will feature billiards, football on our large screen, cash bar, a magician, and tons of phenomenal people. Admission is free- you won't want to miss it! Open ballroom with DJ playing music, billiards, football on TV, cash bar, magician Phil Smith, delicious food and cash bar provided by Black Tie Company. Also, PROPEL will raffle off a free, one-year Energy Group membership ($100 value), and The Portland Club will raffle off a free, one-year membership ($250 value). Join the conversation! Use the hashtag: #TogetherWeToast2016. Join PROPEL at BerryDunn’s office for its first Professional Development Luncheon! The professional development lunch will be hosted in BerryDunn's large conference room on the 2nd floor in the East Tower @ 100 Middle St. Doors open at 11:45 am. They have also graciously agreed to provide lunch! Tickets will be $10 to reserve a seat, which will go towards PROPEL. Space is extremely limited (only 40) so reserve your spot before it fills! Relationships are everything in business, especially in a small city like Portland. Whether you’re looking to meet potential new clients, partners to help you identify business opportunities, or an advocate that will help you find your next career, networking is an effective way to make these connections. Join BerryDunn’s Senior HR Consultant, Sarah Olson, for a discussion on how to use networking to maximize your relationships — and even enjoy the experience. Sarah Olson has over 20 years of human resource and recruiting expertise, specializing in executive level positions in the areas of finance, information technology, operations and sales. Currently, Sarah provides recruiting and consultant work to clients throughout New England, resulting in successful hires for executive level and middle management positions. Sarah's areas of specialization include behavior-based recruiting, human resources consulting, employee relations, facilitation, compliance, and training. Taste the World right here in Portland, Maine! Join PROPEL at the new Fork Food Lab for our second In Focus Series event on November 2nd from 6pm-8pm. Guests will taste delicious foods from around the world, prepared by Tu Casa Salvadorena Restaurant, Ameera Bread, Asmara Restaurant, Babylon Restaurant, and the soon-to-open Mini Mogadishu Restaurant! This event is a unique opportunity to learn more about other cultures, explore a new shared kitchen space and support community development, all while networking with your peers. Coastal Enterprises Inc.’s Start Smart Program: a free business development program that helps immigrants start or grow a business. Maine Access Immigrant Network (main1.org): an organization that bridges access to health and social services for immigrants and refugees in Portland, Maine. Maine Public Health Association: a nonprofit dedicated to improving and sustaining the health and well-being of all Maine residents by advocating for polices and environments that promote public health and health equity. Food tasting tickets are $15. For just $5 more you can participate in a culinary education program with participating chefs to learn how to prepare featured dishes! **Space is limited! Buy your tickets now before they sell out! This event is made possible by the generous contributions of Fork Food Lab, Maine's premier collaborative commercial kitchen serving new and existing food businesses. Event profits will support Fork Food Lab membership for New Mainer businesses in Portland, and will make more events like this possible. Remember how much fun JAM Fest was last year? Well, it was only our first year & we've REALLY amped up the awesomeness! Help us kick off our our In Focus series, by honoring the amazing volunteers of Junior Achievement of Maine & learn more about volunteering yourself. Enjoy yummy appetizers and drinks. Network with fellow young professionals. AND...dance the night away to Model Airplane! Join us for networking at the Fore River Brewery where we will be joined by senior leadership at WEX, www.wexinc.com! This will be great opportuntity to meet some of WEX's leadership team and expand your network into the businesses of South Portland. Fore River Brewery is sponsoring the first beer, there is ample outdoor space and even lawn games. This is sure to be a great way to spend a fall evening! What better way to end summer than a cruise around beautiful Portland, ME! Join us as we celebrate the success of our new Energy Groups! We would like to keep the networking going, so now is your chance to learn more, join a group or even start a group. The cruise will allow you to get in some networking, listen to music, play games & enjoy appetizers all while taking in the beautiful views of Casco Bay. Already in a group? We want YOU to come help us show everyone how fun & rewarding it can be so you and one guest can attend for free! To wrap up PROPEL's first year of In Focus events, we are partnering with Spurwink to bring members the inaugural Brews and BackPacks. At the event attendees will be able to network with their peers and meet other business leaders passionate about helping families through behavioral health services and education (learn more). At the event attendees will have the opportunity to construct individual backpacks filled with goodies for children in foster care and child abuse programs. Don't miss your chance to put a smile on a child in needs face! Tickets are $20 and all proceed go to the Spurwink, and creation of the backpacks. The tickets also include 2 drink tickets and appetizers! Learn More & Register - the first 100 tickets are $15 dollars off! Annually, entreverge brings together hundreds of members of Greater Portland’s business community to award five local entrepreneurs and innovators. The winners will receive the 2016 entreverge prize package to help grow and improve their businesses. This year things are extra exciting as we will be celebrating outside, on a rooftop in downtown Portland. It can't get much better than that! So please, join us for some appetizers & help us raise a glass to the entrepreneurs who help to make Portland an amazing place to live! Join PROPEL at TOP of the East for its bi-monthly After Hours networking event. This event will be special, as PROPEL will be providing details on how to apply to join PROPEL's board and the recent success of members joining the new Energy Groups. AND keeping to tradition there will be a raffle (4 x $25 Visa Cards)!